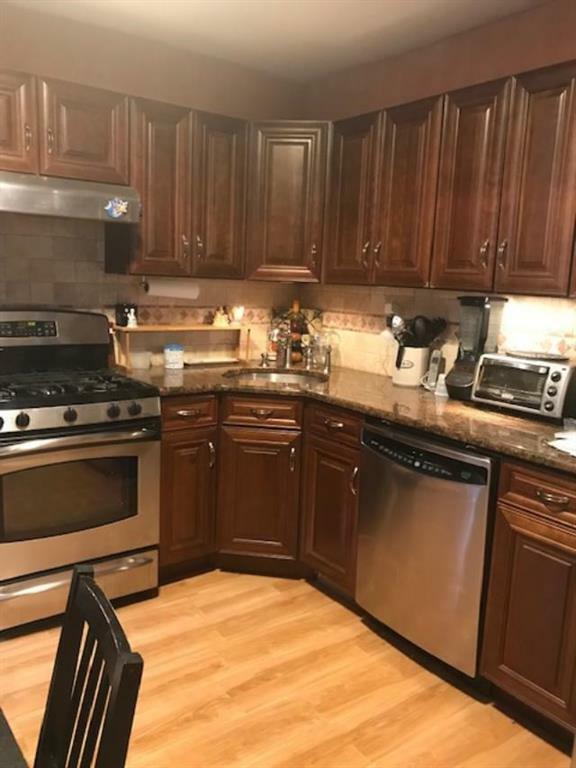 This is a warm, sunny, well laid out apartment with new eat in windowed kitchen with plenty of room for your table and chairs complete with stained oak cabinets, granite counters, stove, dishwasher and refrigerator with an additional breakfast bar. Huge double windowed living room/dining room, 2 spacious bedrooms with deep closets plus 2 coat closets and linen closets in ample entry foyer. This is the apartment for you in an immaculate building that is beautifully decorated, landscaped and maintained inside and out. There is a gym in the building, storage units (nominal fee) and parking (wait list). A very quiet location. the reasonable maintenance includes taxes, gas, heat, electric and upkeep of the building and it's manicured grounds where you'll discover benches and children's play areas to relax and enjoy. 24 hour security provides piece of mind.